Consternation reigned supreme at the grandest of all international violin competitions. There was something strange in the air as the QEIMC Jury President began the trilingual (French-Flemish-English) announcement of prizewinners as midnight approached on the very last evening of a week full of musical highpoints. Her Majesty Queen Mathilde of Belgium was not seated in the Royal Loge when the announcement began thus the concluding speech was suspended for a few minutes: a portent that did not bode well. Subsequently, a moment of confusion ensued when the wrong violinist walked out to receive the grand prize. Two Korean female contestants with similar names achieved the status of finalists; as the First Prize was announced, the first contestant to walk out on stage ("Lee Ji Yoon") was not the prizewinner. Gasps of surprise pulsed through the teeming hall as competition aficionados registered their disbelief at the jury’s First Prize choice. Granted, the 20-year-old Korean-trained, Lim Ji Young (in America,"Ji Young Lim") possesses a warm sound and pleasing stage persona along with the ability to hold phrases in suspension yet her questionable execution of the compulsory work paired with a robust but monochromatic Brahms Concerto did not merit a place amongst the top five prizewinners in a competitive arena with more individualistic, stronger performers. The buzz in the hall swelled to considerable proportions as cheers, bravos and vociferous cacophony greeted favored finalists: Oleksii Semenenko, William Hagen and Stephen Waarts. Second Prizewinner Semenenko is blessed with great charisma and musical creativity that came to the fore in the opening movement of the Sibelius Concerto. Yet, a reliance on two types of vibrato, either no vibrato or fast, over-charged vibrato and a plethora of inaccuracies in the third movement would have justified a lower ranking. William Hagen deserved a high ranking: his Tchaikovsky combined pathos, passion and articulate phrases in a hugely successful performance and his approach to the compulsory work showed maturity and respect for the composer’s demands. As discussed in an earlier blog, Fourth Prizewinner Tobias Feldmann’s Bartok placed great emphasis on the bigger picture: a physical delight in the act of violin-playing and a strong right hand technique deserve mention however the memory slip in the first movement just prior to the ‘e-string’ break took him out of the running for a top-three position. Many arguments could be made for a top prize for Stephen Waarts, at 18 the youngest contestant and the most original musical voice amongst the finalists. A master of color, form and musical character, Waarts mesmerized the audience with cries and whispers, the only candidate to spin a true pianissimo during the entire week of competitive performance. His Bartok emphasized ephemeral, long lines of harmonic meandering over barbaric, folk elements: the king of subtlety and nuance deserved far more than a 5th Prize. The QEIMC is a staunch supporter of new repertoire requiring the performance of compulsory new works in both the semifinal and final rounds. At this year’s contest, three performances of the compulsory Jarrell piece merit mention: Kim Bomsori, William Hagen, Oleksii Semenenko and Stephen Waarts brought the score to life while a scrutiny of the score led to the disarming conclusion that the First Prize Winner was unable to match the solo part to the orchestral score, a central ingredient in effective performance. If the jury gave little deliberation with regard to the Jarrell than why should a compulsory piece take pride of place in the finals? One begins to wonder just how the jury scores the final round. If the two works are given equal weight than surely laureate Kim Bomsori deserved a much higher ranking for her breathtaking Jarrell paired with a solid Brahms Concerto that may have lacked the forte projection of First Prizewinner Lim but was equally meritorious in terms of execution. 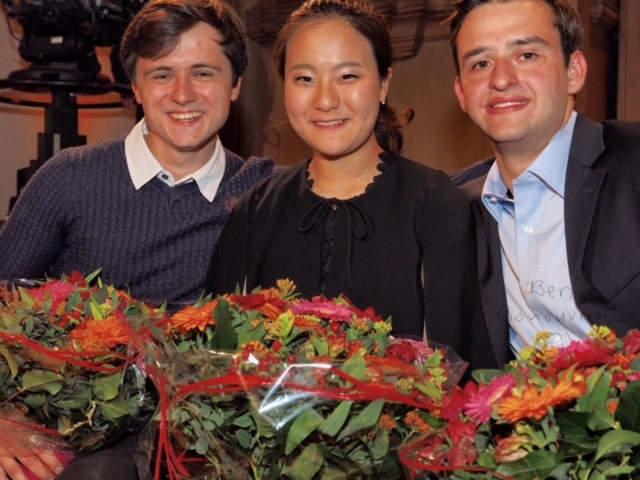 The Sixth Prizewinner Mohri Fumika paled in comparison to several of the unranked laureates, namely the admirable Kim Bomsori, the lyrical Wang Xiao and Kenneth Renshaw who executed the Heifetz cadenza in the Brahms Concerto with panache. Statistics of interest abound and providge grist for conversational mills: 19 nationalities were represented at the QEIMC’s First Round with 7.5 nationalities represented in the finals (Stephen Waarts holds both US and Dutch nationality); all three female finalists, all Korean by birth, performed Brahms, a concerto often considered to be to ‘orchestral’ to win a competition. Beyond the sphere of superlative performances, the competition showcased notable Old Italian violins. Listeners had the chance to hear two Giovanni Battista Guadagnini’s back-to-back on Wednesday night and three generations of Guarneri’s during the week. Only one contestant, Mohri Fumika opted for a comparatively contemporary instrument made by Poggi (1950). The morning after the revered Queen Elisabeth Competition 2015 came to an end, pundits and music lovers gathered in Brussels’ cosy venues and across the worldwide web to comment, reconsider and relive. In Brussels, the sun broke through a stormy sky as if to remind us that it is music that wins the day. Jury pronouncements are irrevocable however history has proven that the truly great will persevere and triumph. Many laureates of the past have taken their places at the pinnacle of the profession regardless of competitive rankings. While the jury may have taken the safest option, the public begged to differ. In a small country where the French and Flemish rarely agree, Stephen Waarts won the audience prize presented by the Flemish and French broadcasting authorities: the VRT-Prize and the Musiq'3 Prize of the RTBF. Vive la difference! Like always there is much controversy about the judging of the price winners. Bartok said that competitions are for horse races not musicians. I think a comparison with gymnastics or Olympic figure skating is a better one, because they are also sports with a jury (A competion is also a "sport" because the candidates use sometimes beta-blockers or speed, although they are not controlled and therefor it is not forbidden). OK I know there are a lot of traditions with competitions but it is also possible to let a candidate wait on a chair while she/he gets the score for technical merites and artistic merites and points for the compulsary piece, like on this movie of Olympic figure skating after 6.08 minutes. The highest and the lowest jury points are deleted. Than before the last day of the competition the 1st ranked candidate knows he/she could be 3th when the last 2 candidates gets more points. When you play for example a difficult technical piece in the semi's like Semenenko with I Palpiti of Paganini you get more points for your technical merites, although you can get more deductions when you make mistakes and false notes, like a figure skater with a difficult programm with a lot of triple Axels and other jumps, who falls to often on the ice. When you play a Beethoven sonata the technical merites are lower, because of the easier technical difficulty, but there you can get more points when you play it with high artistic merites or musical feeling, but that is still quite vague and arbitrary. Perhaps you can use an extra jurymember for example 100 people or the group of 6 young people, in the audicence who give points. Their points are together also used like they are an extra jurymember. Now the 2 audience price winners was 5th according to the jury and that is too much difference. Here the points from the jury for gymnastics for 'difficulty','execution','penalty' and (total)'score' after 2.30 minutes. I agree with many comments you've made, but I think the energy of the performance should also be considered in a competition that might reveal many future great soloists. Stephen Waarts is a truly musician who possesses one of the beautiful tones in the competition, but I think his approach to Bartok was a bit too careful compared to Tobias Feldmann’s, who truly showed how music can come out of the score. Being careful is not a bad feature, but in a competition like this, we want to see someone who takes risks, someone who shows they can be the next generation of soloists. Good thing is that Stephen is very young and has been prizewinner of many competitions. I would love to see him winning the Queen Elisabeth next time. For me, there is no question that Oleksii Semenenko and William Hagen were the most prepared in the competition. Truly musicians, they showed incredible interpretation of their pieces in all of their performances. I think that today is very hard to find someone who interprets a virtuoso work, but full of nuances and musicality as Oleksii Semenenko did in Paganini's Palpiti. It reminded me of the great performances of Leonid Kogan, whose musicality in virtuoso works always brought something beyond simple violin playing. That, along with his perfect Mozart concerto, surely must be recognized. The only thing I can think of that could lower William Hagen's performance and ranking are his off-the-string strokes. Specially in the third movement of Tchaikovsky, some of the pitches could not be heard clearly due to inconsistent strokes. Overall, that was a memorable performance of Tchaikovsky. No questions that Hagen will be a big name. Kim Bomsori's performances were breathtaking. Great phrasing ans lovely tone. Her Mozart was very elegant, full of energy and style. Just lovely. For Brahms, I think she could use a bit more power in a German way. Ji Young Lim showed great capacity of playing the great Brahms concerto, specially being the second piece she played that night. Very appropriate sound, big phrases, breathtaking moments, specially in the suspensions. Very energetic and not once too careful. This is the kind of performance we want to pay for. I cannot discuss the compulsory work, as I don't have access to the score. However, in the previous rounds, I agree that she was somewhat behind some of the candidates. Very hard to rank so many great candidates. I couldn't say it was unfair if five candidates took first prize. Just for fun, here is my rank, according to the overall competition. Now, lets just wait for the Tchaikovsky competition that is coming up this month. Let's see whose recordings and concerts we're mostly raving over in ten years. My money is on Waarts.